Dinner Time and Food Allergies. Two phrases that, when paired together on a busy weeknight, probably invoke stress in even the most Zen of minds. I have a motto I live by on those hectic days in order to prevent a loss of my sanity. (...although, those who know me well may say that I may already be too late for that though). My motto? Cook Once. Eat Twice. I have gotten darn good (if I may say so) at the art of cooking extra servings of one meal to create something new with the extras for the next one. Oh. And they are only called leftovers if the meal looks the exact same as it did the night before. When you switch a few things up and add a twist… it is a brand new meal. You can then call it anything. Just do not call it leftovers. People get funny about leftovers. Trust me. I know this. This is the simple way I can make sure my family is still eating healthy on nights when I have anything but time to spend concocting up grand meals in the kitchen. Since I am pretty sure that there are a lot of you out there that are like me and just want to be able to get a healthy and simple ALLERGY-FREE meal on the table for your family, I thought I would share some of my ideas with you. 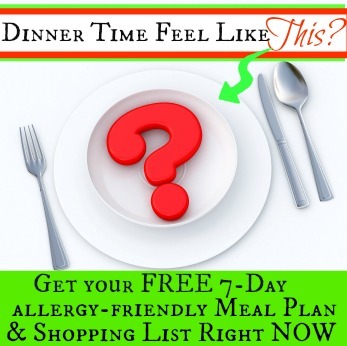 I have put together an easy 7-Day Allergy-Friendly Meal Plan AND the corresponding shopping list to make your week just a bit less hectic! It even works with our craziest of schedules! SO…If you want your free copy of it, just enter your name and email into the box at the top right. It will be in your inbox shortly and you can run to the grocery store with your list and get everything you need to make your busy dinner hour a bit easier this week! 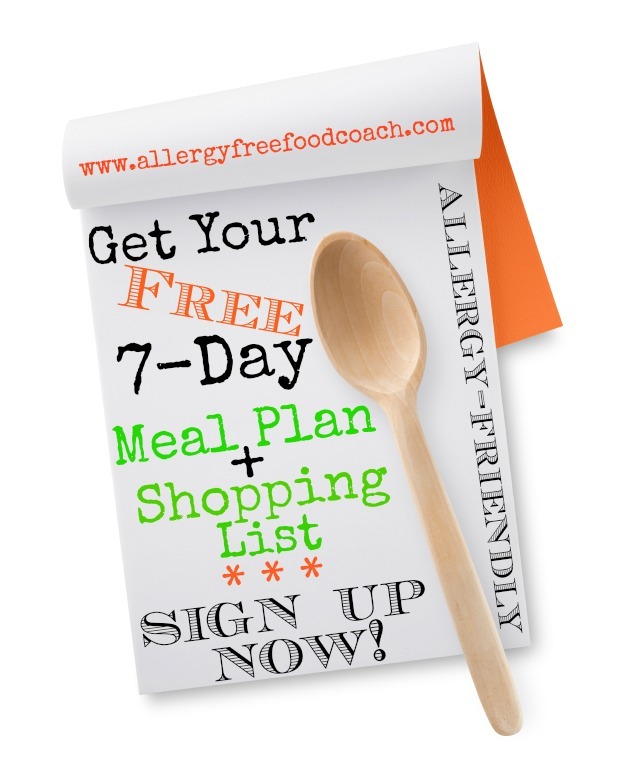 Then pop over to my Food Allergy Coaching Website – Allergy Free Food Coach – and discover more ways to feel less overwhelmed about your food allergies! Very cool Kim! I will have to learn to repurpose leftovers better. Tony and my niece don’t eat leftovers, so it’s always on me! Sigh. People that are already a subscriber with they be able to get this 7 Day meal plan????? I try to cook enough to not have massive amounts of leftovers, but so that I have enough for lunch for a couple of days! Thank you for this!